AnalogX Netstat Live (NSL) is a simple utility that you can use to monitor Internet speed from home network, so that you can know the actual connection speed of wireless, cable, DSL or dial up Internet connection. You can download the NSL from Analogx website. This program is easy to use! Once you have installed and ran it, it will show you live incoming/outgoing traffic throughput (current, average, max) and also incoming/outgoing total traffic (last reboot, this month, last month). Don’t understand what is throughput? Throughput means amount of data sent/received in certain time period, such as bit per second (b/s) or byte per second (B/s). Furthermore, it also shows you CPU usage of your computer. 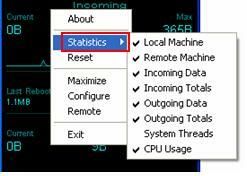 Right click the NSL and select Statistics; you can select several statistics to be displayed. In this case, I did not enable the System Threads statistic. If you right click NSL and select Configure, you can select to display the network throughput in Bits (b/s) or Bytes (B/s) format. Kindly have a look on some other configurations as well if you like. One more interesting feature is you can do remote host ping and trace. Right click the program and select Remote, key in the URL or IP which you want to ping and trace, hit Enter key and then it will show you the result. 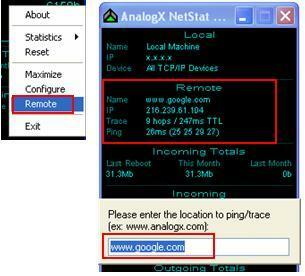 Return to top of "Monitoring Internet Speed Using AnalogX Netstat Live"